One of my favorite pictures taken during the Apollo 11 mission to the moon 45 years ago was Buzz Aldrin’s famous boot print in the lunar soil. While it looks like he might have been doing it just for fun, pressing his boot into the fine, powdery soil had a purpose. Aldrin and Neil Armstrong were asked to carefully observe and assess the properties of the regolith. Notice things like how deep their boots sank in the gritty stuff as well as how it affected their ability to walk about on the surface. Close up photos were taken, including 3D stereo images. Mission control didn’t leave a pebble unturned. It was all part of the mission’s Soil Mechanics Investigation. The soil on the Moon is very fine-grained, with more than half of all grains being dust particles less than 0.1 millimeters across. It not only adhered to their boots in fine layers but provided good traction. Typically the astronauts boots sunk down only one-half to one inch (1.5-2.5 cm) into the lunar regolith. Even though the moon is airless, windless and essentially waterless, erosion happens. Bombardment by protons from the solar wind and micrometeorites (bits of interplanetary dust shed by comets and spalled from asteroids) never stops. Earth’s atmosphere slows micrometeorites, allowing them to drift down gently to the surface. No so on the airless moon, where space grit grinds away mercilessly on the lunar rocks. Before the unmanned Surveyors landed, some astronomers thought that moon dust might be so deep it would swallow a spacecraft. Before Neil Armstrong made his historic ‘first step’, he first tested the ground to make sure it was firm. Their surfaces are riddled with countless ‘zap pits’ from micrometeorites that strike the surface at thousands of miles an hour. Slowly, inexorably the mountains are ground into more rounded forms. It’s estimated that micrometeorites churn the lunar soil once every 10 million years. Aldrin’s boot prints and for that matter, all the impressions in the dust left by the astronauts and their equipment, will remain in place for 1 to 2 million years. Incredibly long by human standards. Extreme temperature differences between daytime highs and nighttime lows also must play a part in breaking apart rocks and furthering erosion. At the lunar equator, mean surface temperatures reach almost 260 ºF at noon and then drop to -279 ºF during the night. The moon also gets whacked by larger meteorites that send up plumes of dust that fill in crevices and soften sharp edges. Sunday marks the 45th anniversary of the Apollo 11 lunar landing, when our toes touched a world other than Earth. While astronauts left countless impressions in the lunar dust, Aldrin’s single boot print has come to symbolize humanity’s first steps from the cradle of Earth into that big thing we call the universe. I hope we can return soon. I don’t know if you have it, but there’s a Stellarium app for Smartphones. If you have it, do you know if it can be used without having an internet connection on the phone? Thanks Tony. 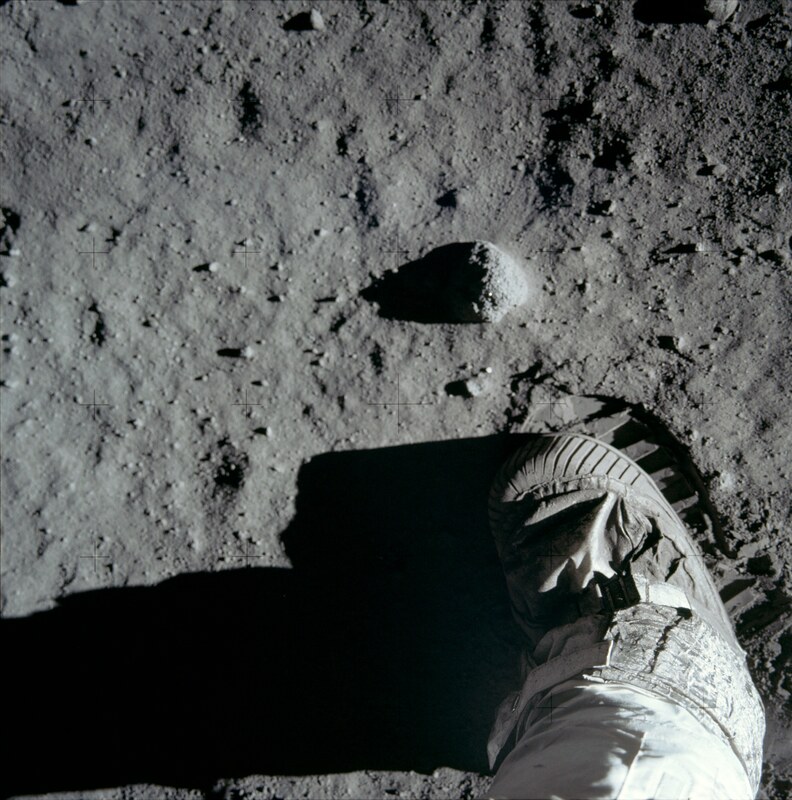 I was especially glad to find the one of Aldrin taking the picture of his boot. “Take Only Pictures, Leave Only Footprints”, although Buzz & Neil also took some rocks while everyone was looking. Meanwhile, back on Earth, there’s some dinosaur footprints here in Colorado that have been around for 100 million years plus. As with the dinosaur footprints, there’s quite a story behind fhose footprints on the moon. Thanks for telling it, Bob! Thanks Richard. Interesting that the dinosaur prints have lasted much longer than the lunar prints thanks to fossilization, something that can’t happen on the moon. Bob, what do you think is the main reason NASA has never gone back to the moon? Is it funding, lack of further interest in the moon, or some other reason? I think the government and public felt we achieved what we wanted – went to the moon and won the ‘space race’. After that, there were new priorities – building the space shuttles and space station along with intensive robotic exploration of the solar system. Hopefully the pendulum is swinging back with plans for manned exploration of a near-Earth asteroid. Don’t you think, though, that it’s a pity they went just to win a race? I hope some space agency, whatever country it’s from, will go back to the moon, to do some more widespread exploration, and even set up a base there. I know the Chinese have a manned moon mission in their sights. 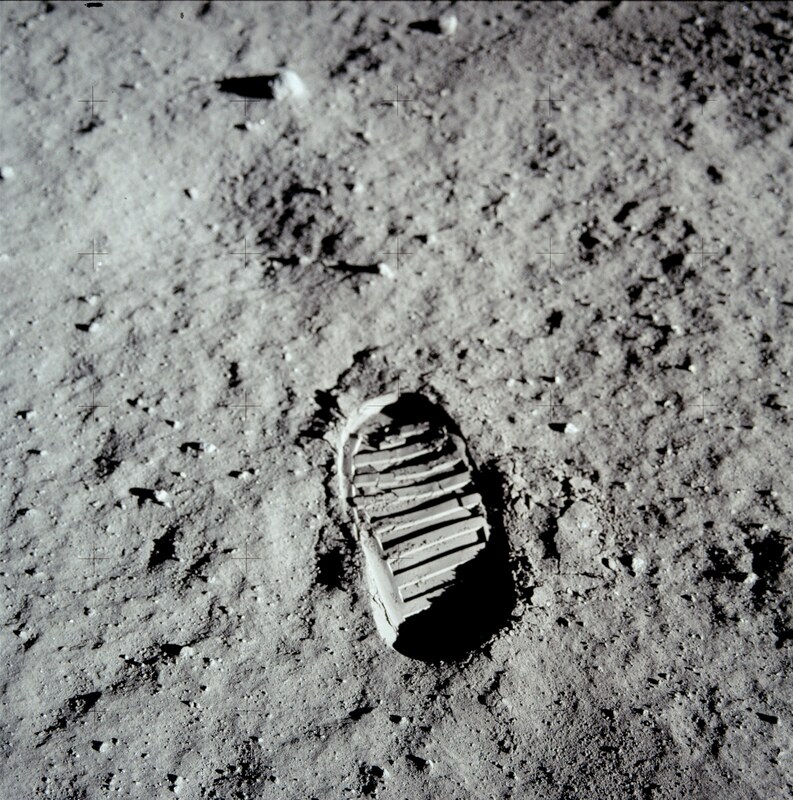 I don’t think the Apollo 11 astronauts took a photo of the impressions Armstrong’s boots made when he made the “giant leap” for the first time—but they should have! That would be a very historical photo! Also, it wouldn’t surprise me that most people, when they look up at the moon, do not know the general area where Apollo 11’s Eagle module landed. I agree. I’d say 99.5% of people couldn’t point out the Sea of Tranquillity on the moon. Excellent point about no one photographing the FIRST steps on the moon. Kind of you to write and say so. Thanks! Those darn space tourists – they’ll ruin everything! What a thing to imagine. Should that day come, hopefully the area will be protected. You might be right. Since the first were at the bottom of the ladder, they may have been destroyed as the astronauts came and went up and down the ladder.